john4jack (Corvallis, Oregon, United States) on 26 October 2009 in Business & Industry and Portfolio. Photomatix. The color work was done in Lightroom and Photoshop. ONE MORE THING - LR 3 beta is considerably faster than LR 2. WOW!!! Stunning!! The processing is spot on :) I love the final result. and it doesn't fit in ANY box that I know about. ;-) Fantastic. I agree about boxes (about myself!) ...glad you are having fun experimenting and producing such work..this is a really interesting picture you have made. Pampas grass is beautiful enough to be photographed even if there is a stunning autumnal tree next to it! The result is magnificent! Especially because the post-treatment fits into the picture, but does not replace the image! example: image made! The image is natural, but suddenly becomes very intimate! j'aime beaucoup! @Mathilde Collot: Merci, dear Mathilde. Very interesting, looks like a babylense shot. The extreme range of blur and detail make this one an eye-catching image. I think you're experimentation is working out quite well. i love that radial motion of the tree from the bluring -- makes me think of stars and rockets! and then contrasted with the absolute stillness of the pampas grass, a very intriguing image!! Fantastic focus choice, I like also the autumn colors. Beautiful capture of this selective focus! It seems to bring out even more color from the surroundings. @Steven: Thanks, Steven. The selective focus is all in the processing. Nice isolation work on this pampas grass cluster. Oh so cool! I love the look of this...My attention is drawn first to the grasses- as I know you intended. But I also like what is going on to the left- the large tree and great color, which would usually dominate an image like this if all were in focus, becomes a wonderful way to accent the beautiful pampas grass. At first I thought maybe you had used a perspective control lens- (like a lensbaby). THAT is SUPERB, love that ethereal softness, and the colours are splendid!!! You've made your escape (from your boxes) in dramatic fashion, Jack. Freeman Patterson is really great. He has a collaborator--Andre Gallant--who is also very inspiring. Check out Gallant's "Dreamscapes: Exploring Photo Montages"--wonderful! @Bill: Thanks. Will do so on Gallant. OK, have done it. No price break on Amazon. Fantastic ! 5 * for me !!!! Getting very creative here. Very nice touches. I really love the sense and suggestion of color. I love the light on the grasses. I'm a little on the fence about the extreme Gaussian blur on the left. I'm not sure, I think it overwhelms the image a bit. @Laurie: You're probably right, but I wouldn't want to reduce it too much; I want the Pampas Grass to pop. Both sharp and blurred, a strange sensation. Beautiful photo belle composition ! I like the efx, and the Pampas Grass does look very nice with the golden colours! May be I would have prefer the effect on the overall image? but in photography it is nice to make different tests like you did here. Good thing you blurred the rest to put impact on the right pampas grass. 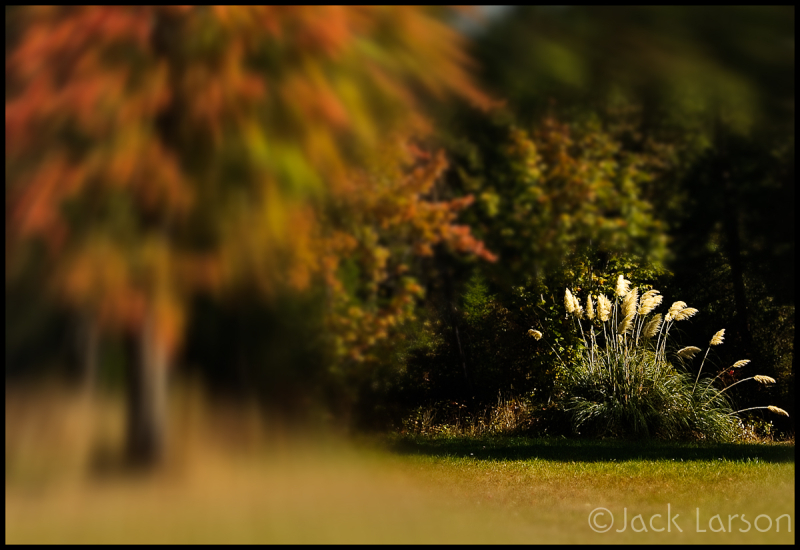 Great post processing ... the pampas grass really stands out and the fall colors to the left are a great detail. The transition between the blurry and sharp part is a bit too strong, next time I would fade it a bit more (set the feather of the selected area a bit higher). @Monique: Yeah; I agree. Actually it looks much better as a print than on the computer. The print seems to create some of that feather. Wow, nice work. I actually like the effect on the colorful tree as much as the clarity of the Pampas Grass. So that is what it's called, we have it here. Nice processing John ! thanks for explanation ! I always thought Freeman Patterson to be one of the must read photographers. I started getting his books in the early 80s and he had huge impact. please tech me how to do it. @ghetu: The original photo was of a large oak tree with the Pampas Grass to the side. I first cropped it to make the grass much larger. Then I did my color work in Lightroom. After that I sent it to Photoshop where I applied a Gaussian Blur to the entire image. I added a mask and eliminated the blur of the grass. There was some more stuff done but those were the essentials. If I had it to do over again, I would apply less of a blur and would feather the blur. At the time, it was all an experiment. Seems like the idea to get the focus on a particular objet in a whole shot ..this is an awesome way to do it..and its great..plus lovely tones...patience to here. thank you very much. i will keep your instruation nearby while experimenting with a photo. i don't know anything about photoshop and anything i try with that becomes incredibly ugly. i wish i knew you in person and cone drop by for a small class. @ghetu: Thank you. Good luck. Photoshop has a very steep learning curve.